The third-generation Acura MDX received a complete redesign for the 2014 model year and now benefits from a major refresh for model year 2017. Upgrades and improvements for 2017 include refreshed exterior styling, highlighted by a bold new diamond pentagon grille drawn from the Acura Precision Concept. All 2017 MDX models now come with the AcuraWatch™ suite of safety and driver-assistive technologies, a first in the luxury SUV category. AcuraWatch combines with Acura’s next-generation Advanced Compatibility Engineering™ (ACE™) body structure and a comprehensive list of active and passive safety features to deliver intelligent safety and confident driving performance at the top of the competitive segment. All 2017 MDX models also benefit from increased standard luxury and technology features including an Electric Parking Brake with Automatic Brake Hold, Auto High Beam headlights, SiriusXM Radio™ 2.0 and four 2.5-amp USB charging ports. 2017 MDX models with Technology and Advance packages add Bi-Directional Keyless Remote Engine Start, new 20-inch wheel and tires (+1 inch), power folding side mirrors, and HD Traffic™. In addition to these features, Advance grades add LED fog lights, genuine Olive Ash Burl or Black Limba wood interior trim, a heated steering wheel and Surround-View Camera System with six selectable viewing angles. Advance models now also come equipped with two second-row captain’s chairs and a center console with two USB ports, replacing the three-person second-row seating found on lower grades. An ultra-widescreen Rear Entertainment System is also available on models with the Advance ENT Package. All MDX models offer a choice of front-wheel-drive or Super Handling All Wheel Drive™ (SH-AWDâ). Both the Technology Package and the Advance Package are available with the Entertainment Package. An expansive range of genuine Acura accessories designed specifically for the MDX is also available. The 2017 MDX was designed and developed in North America and is produced at the company’s Lincoln, Alabama manufacturing facility using domestic and globally sourced parts. Beginning in early 2017, MDX production will commence both the Alabama plant and at the East Liberty, Ohio auto plant. The 2017 Acura MDX leads its class with its combination of power and fuel efficiency. Power comes from an advanced 3.5-liter direct-injected i-VTEC™ V-6 engine rated at 290 peak horsepower and 267 lb.-ft. peak torque (both SAE net). It incorporates a range of advanced friction-reducing technologies that help boost fuel efficiency and power output, and features a crossflow magnesium intake manifold, special “tumble” type intake ports, special piston-crown shapes, and an 11.5:1 compression ratio. Acura’s i-VTEC™ (intelligent Variable Valve Timing and Lift Electronic Control) for the intake valves is combined with Variable Cylinder Management™ (VCM™) to widen the power band and maximize fuel efficiency. During startup, aggressive acceleration or when climbing hills, VCM operates the engine on all six cylinders. During moderate speed cruising and at low or moderate engine loads, the system operates just the front cylinder bank. The 2017 MDX with front-wheel drive is rated at 20 mpg city/27 highway/23 combined (with Idle Stop). The 2017 MDX with Super Handling All-Wheel Drive is rated at 19 mpg city/26 highway/22 combined (with Idle Stop). The MDX also meets the stringent ULEV-125 California Air Resources Board (CARB) and EPA Tier 3/BIN 125 emissions standards. Joining the efficient front wheel drive and Acura’s acclaimed Super Handling All-Wheel Drive™ (SH-AWD™) system is a Sequential SportShift 9-speed automatic transmission with racing-inspired shift paddles, standard with both drive systems. 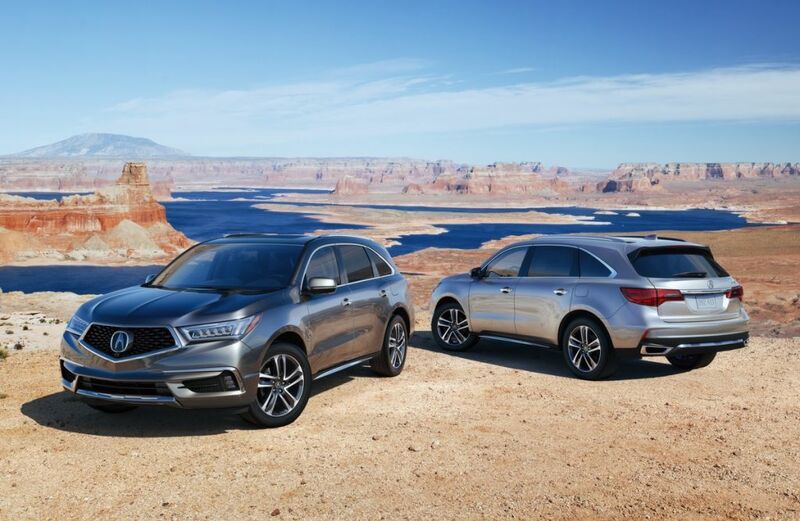 Advanced material grades, including hot-stamped, high-strength steel and magnesium, give the MDX’s body superb torsion rigidity, the foundation for its confident handling, refined ride quality, and low cabin noise, vibration and harshness (NVH). The hood and front fenders are made from lightweight aluminum, improving both handling and fuel efficiency. Acura’s next-generation Advanced Compatibility Engineering™ (ACE™) front frame structure helps the MDX target top crash-test ratings in frontal collisions. Crash safety performance is further enhanced by the MDX’s one-piece hot-stamped steel door stiffener ring (comprising the A-pillar and B-pillar, roof rail and lower frame member), which helps manage collision energy in frontal offset, side impacts, and roof load management in the event of a rollover. Together with the rigid unibody structure, the MDX’s 4-wheel independent suspension, Motion-Adaptive Electric Power Steering (EPS), Agile Handling Assist, Vehicle Stability Assist™ (VSA™) and 4-wheel disc brakes with ABS ensure athletic handling, a comfortable and quiet ride, and a high level of active safety performance. Finely calibrated suspension geometry and bushings combined with the MDX’s special Amplitude Reactive Dampers help provide optimize ride and handling. 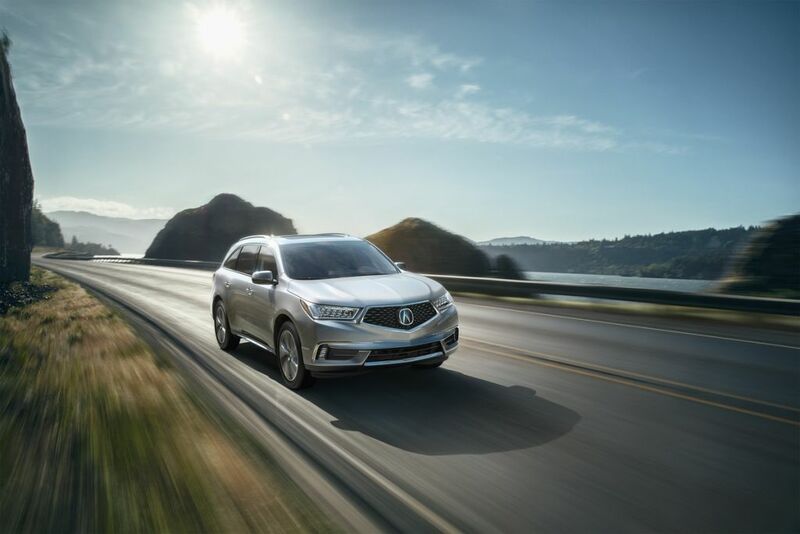 In addition, the Electric Power Steering tuning eases low-speed steering effort and offers solid high-speed steering feel, making the MDX easy to drive while also promoting a high degree of driver confidence. 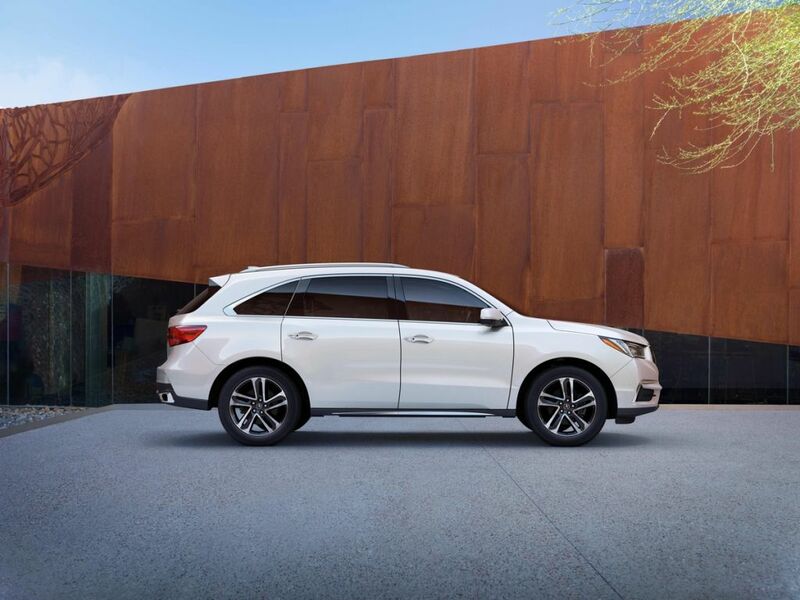 For 2017, every MDX model and trim level includes the AcuraWatch suite of advanced safety and driver-assistive technology, including Collision Mitigation Braking System™ (CMBS), Lane Keeping Assist (LKAS), Adaptive Cruise Control (ACC) with Low-Speed Follow (LSF) and Road Departure Mitigation (RDM). Using millimeter wave radar and a monocular camera to detect other vehicles as well as lane markings, AcuraWatch can help intervene to prevent or mitigate the severity of a collision. Supported by Adaptive Cruise Control with Low-Speed Follow and Lane Keeping Assist, AcuraWatch can also significantly decrease the driver’s workload during freeway cruising. All 2017 MDX models feature new Auto High Beam headlights, a new Electric Parking Brake (EPB) with Automatic Brake Hold. The MDX with Advance Package also features a new Surround-View Camera System with six selectable viewing angles. The 2017 MDX earned a five-star Overall Vehicle Score from the National Highway Traffic Safety Administration (NHTSA) and is anticipated to receive a TOP SAFETY PICK+ rating from the Insurance Institute for Highway Safety (IIHS). The restyled 2017 MDX’s distinctive diamond pentagon grille represents the new face of Acura. 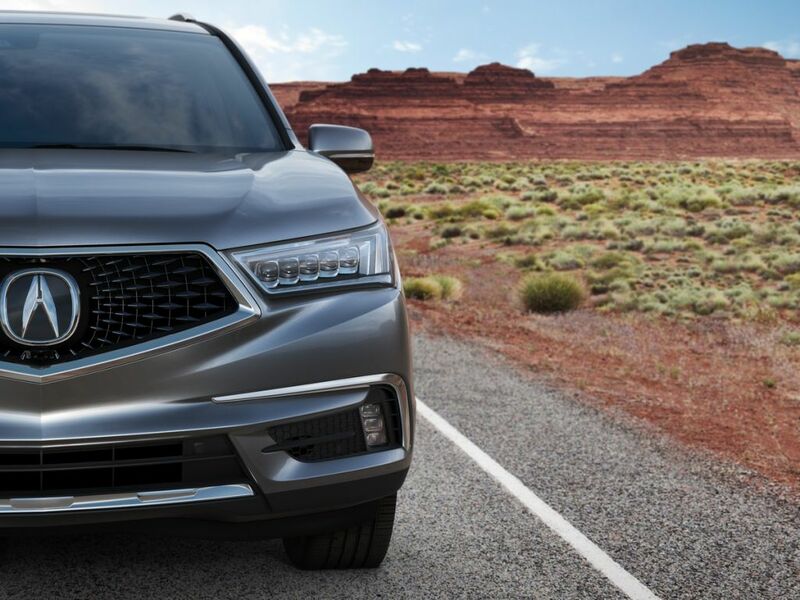 Integrated with a more sculpted hood, front fascia, front fenders and revised Jewel Eye headlights, the result is a more “executive athletic” appearance for the Acura’s class-leading luxury SUV. Additional styling updates include new chrome rocker panel trim, a revised rear bumper and skid garnish, and new dual exhausts with bright finishers. LED lighting includes the headlights, front turn signals, tail lights, outside mirror-mounted puddle lights and, on Advance grades, new LED fog lights. Technology and Advance grades get upsized 20-inch aluminum alloy wheels (previously 19-inch). Other available exterior features include power folding outside mirrors, available roof rails and improved remote keyless entry with Walk Away Auto Lock. 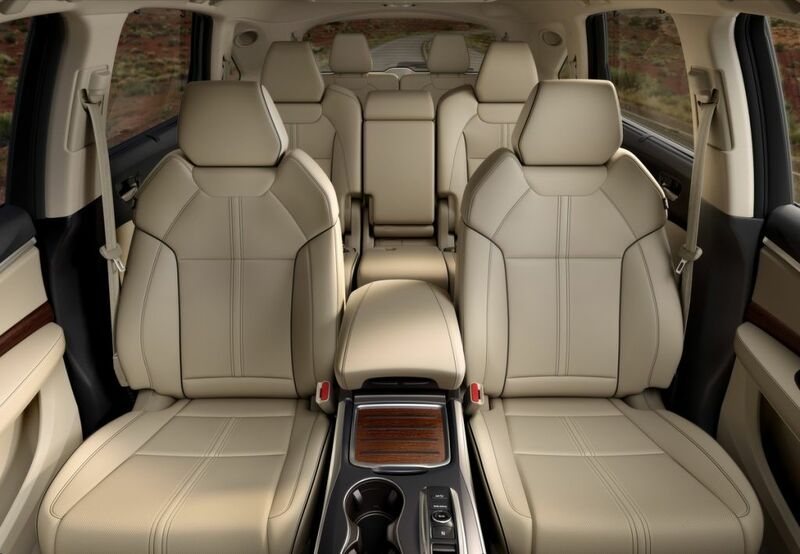 The 2017 MDX offers a high level of luxury, convenience and technology in a spacious cabin graced with high-end appointments including standard leather seating surfaces and available new genuine Olive Ash Burl or Black Limba wood accent trim (Advance Package). The MDX comes with standard three-row, seven-passenger seating. Advance grades accommodate six passengers with new second-row captain’s chairs and a center console. Smart interior packaging provides usable and versatile passenger and cargo space, including an Extended Slide feature for the second-row seats and convenient One-Touch Walk-In access to the third row. While up front, a large storage area in the center console can accommodate a purse and even tablet computers. New seat styling with contrasting piping and stitching and perforated Milano premium leather seating surfaces elevate the luxury look and feel of the Advance Package. As in previous generations, the 2017 MDX offers a broad range of standard and available comfort and convenience features. A Multi-Angle Rearview Camera is standard, and the newly available Surround-View Camera System and heated steering wheel join the new second-row captain’s chairs as Advance Package exclusives. The extensive list of MDX comfort and convenience features continues with the Smart Entry Keyless Access System and push-button start. GPS-Linked, Tri-Zone Automatic Climate Control and remote engine start are standard on the Technology and Advance Packages, and a heated steering wheel is exclusive to the Advance Package. The 2017 MDX’s wide range of standard and available tech features are intuitive and easy to use via its 8-inch color audio/information screen and 7-inch On-Demand Multi-Use Display™. The MDX’s next-generation AcuraLink™ maximizes connectivity for the driver and passengers with thousands of media channels available through Pandora™ and Aha™ mobile, delivered via the owner’s internet-linked smartphone and data plan. Utilizing built-in cell technology, AcuraLink offers numerous safety, security and convenience features including collision notification, remote unlocking, stolen vehicle tracking and surface street traffic information. Standard electronic features include SiriusXM Radio™ 2.0 and four 2.5-amp USB charging ports, the next-generation AcuraLink, Bluetooth HandsFreeLink, Siri™ Eyes Free and SMS text messaging. Available electronic upgrades include a choice of Acura/ELS premium sound systems, a 9-inch DVD Rear Entertainment System, an ultra-wide 16.2-inch WVGA DVD Rear Entertainment System, and an Acura Navigation System with voice command capabilities and new HD Traffic data.